People in western Britain are being warned about more ice on the roads, as police reported a major pile-up on a frozen motorway. Greater Manchester Police said seven people had been injured in the crash, which involved up to 10 cars on the A627(M) in Oldham. Met Office severe weather warnings remain in place in Wales and western parts of England and Scotland. 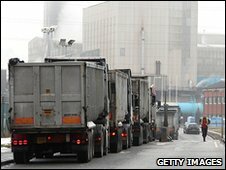 Salt shortages will limit gritting, making driving conditions difficult. More snow is likely in the Pennines and Scottish and Welsh hills but the Environment Agency has warned about flooding in some areas. Temperatures in the West may reach 10C (50F) later, and there are fears warmer weather in the coming days may bring flooding. BBC weather forecaster Sarah Keith-Lucas said Saturday could see localised flooding in western parts of the UK caused by melting snow and rain. The Met Office said: "Heavy rain will move in from the west accompanied by strong to gale-force winds." It added that up to 25mm (1in) of rainfall was likely. An Environment Agency spokesman said: "There may be an increased risk of flooding in some areas over the weekend due to predicted heavy rain and the partial thawing of snow due to slightly higher temperatures." Martin Annis, head of emergency planning at the British Red Cross, said the warning should be taken seriously. "We know from our experience in Cockermouth and from the floods in 2007 that a few simple acts can make all the difference," he said. "We urge people to observe simple tips when preparing, such as packing essential items and documents they will need if evacuated, preparing an emergency kit with water and first aid pack; as well as keeping a regular check of TV and radio updates." Milder weather helped the UK's transport network get back to normal on Thursday, after a day of delays and cancellations on railways and at airports. Runways at London City, Birmingham International, Southampton and Cardiff airports were all open, having been closed for snow clearance for part of Wednesday. However, Gatwick - where flights had been suspended for 12 hours - was experiencing knock-on delays on Thursday. National Rail said most train operators were running normal timetables again, although disruptions still affected East Coast services in Scotland and between Leeds and London. TransPennine Express was operating replacement buses in north-east England and four Eurostar services were cancelled. The day began with Met Office warnings of treacherous roads and police reporting black ice in several areas. The Highways Agency and councils have cut their use of salt for gritting roads by half - up from the 25% agreed last week - to protect supplies. Councillors in Leeds and neighbouring Kirklees warned they had less than two days' supply of salt left, while private salt firm Grittit has brought in security guards after 75 tonnes of material was taken from its depots nationwide. However, the Highways Agency reported "business as usual" on major routes in England. A number of roads in the Highlands remained closed because of snow, along with several routes over high ground in Wales, the A66 in Cumbria and the A628 in Derbyshire. Fresh snow swept through southern Scotland, shutting some schools and leaving some roads in the Borders passable only with care. Most schools in England, Wales and Northern Ireland were open for students sitting A-level, AS-level and GCSE exams. However, many were closed to other pupils. In West Yorkshire, 200 shut. Across Wales, at least 440 closed - mainly in the Valleys. Exams watchdog Ofqual said it had not been informed of any centres being unable to hold exams, although some may have made alternative arrangements such as switching pupils to alternative venues or estimating grades. Freezing conditions have caused water pipes to split in many regions. Yorkshire Water has been taking 160 calls a day about the problem and has 75 teams repairing them. Meanwhile, rescue teams in Snowdonia have warned about the dangers of avalanches after 500 tonnes of snow slid down a mountainside near Aber Falls. Forecasters say Sunday and Monday will be much drier, bringing some respite. The AA predicts the thaw will reveal a 30% increase in the usual number of potholes. Councils spent £67m filling in almost 1m last year, figures suggest.